﻿I have had the benefit recently of learning about the stories of Richard, Charlie, and Dierdre Croft though the documentaries focusing on Richard and from Dierdre’s own writing. The documentaries teach so much about experiencing the support and love of a person with a severe ID ini Australia across 4 decades. The first, Driving with Richard, introduces the family and contains scenes of the trauma when someone is hitting, hair pulling, but also loving – I think this is a must watch for anybody supporting people with challenging behaviours – it can only feed an empathy. The second, Wonderboy, shows Richard growing out of schooling and his life with his father. It unpicks the complexity of choice in the context of different people and different abilities. It has particularly got me thinking about the place of strong voice in the support of people – when do people need strong boundaries, who can deliver strong boundaries? Who is qualified to speak for those who cannot speak for themselves? 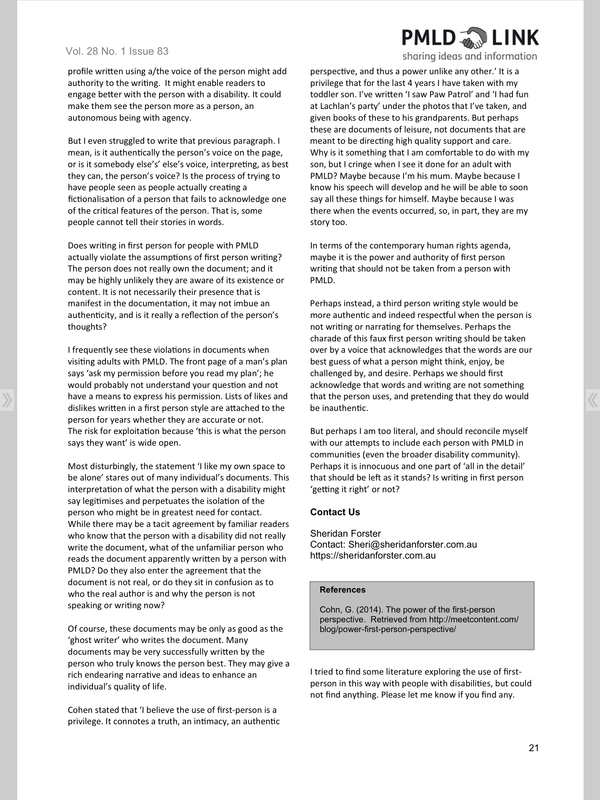 In making this submission, I begin with a question in my own mind, which I hope your own committee may also pose, as well as answer, in the current review of the National Disability Advocacy Program. 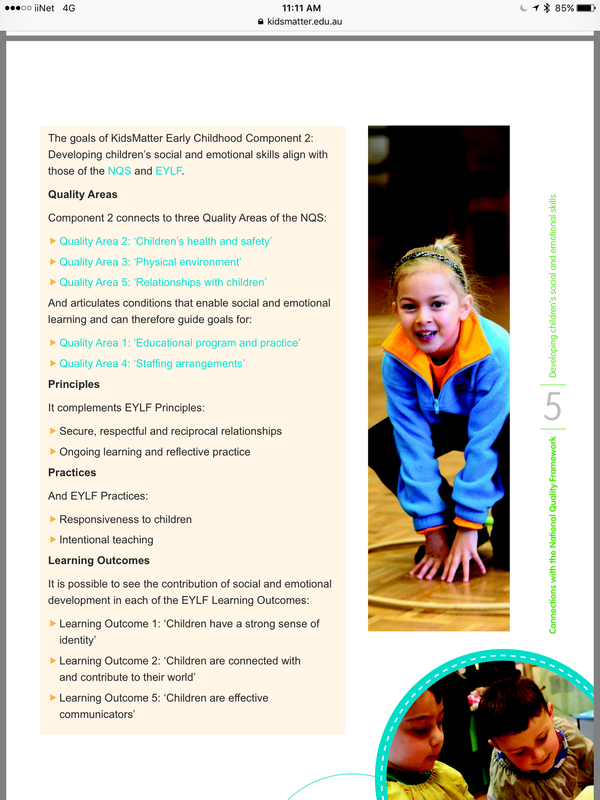 Who is best qualified to represent and advocate for my son’s lifelong needs for support with personal care, skills development, physical activity, recreational opportunities, social engagement and other quality of life dimensions? Who is best qualified to represent and advocate for the systemic issues and obstacles facing people, like my son, who have a severe intellectual disability and complex needs and who are, in many cases, unable to speak or advocate for themselves? TO ADVOCATE FOR MY SON? As well as a severe intellectual disability, Richard is sight impaired. Would a person who has lived experience of being blind or vision impaired be sufficient to inform any advocacy they may undertake that is relevant to the lifelong needs of my son and of others like him? I think not. Although Richard can walk, he also has mobility challenges and needs support to navigate the physical environment. I wonder whether a person who is also restricted in their mobility, but otherwise intellectually competent, could understand and advocate for the needs of someone like my son, and other people with intellectual disability who similarly experience mobility restrictions. Again I think not. Richard has no verbal communication. Perhaps a person with hearing impairment might understand what it may be like for someone like Richard who also faces communication challenges? No again. From the range of disabilities listed above and, as an intellectually competent person, I can quite easily imagine what it might be like to be blind, or to be deaf or to have mobility restrictions. I could even use a few props to enhance my understanding. I cannot, on the other hand, imagine what it is like to live with a severe intellectual disability as Richard has, nor do I understand how my son perceives his world. It is only because I have a close and long term personal relationship with my son that I am able to pick up on the subtle changes in his state of equilibrium and sometimes, not so subtle, changes in his behaviour which enable me to discern how he is travelling and/or what may be disturbing or disrupting his quality of life. For people with physical or sensory disability, I believe I also understand some of the access and inclusion issues they might face in their quest to participate and be included in all dimensions of Australian society. I would, however, suggest that the physical and social barriers faced by people with physical or sensory disability can, in large part, be readily rectified with some accommodations in the physical environment and/or by championing changes in discriminatory public attitudes. In a hierarchy of human needs, the “access and inclusion” and “choice and control” issues advocated by, often highly intelligent, articulate people with physical and sensory disability are nowhere near the priority issues impacting on my own son’s wellbeing and quality of life. My son’s disability is pervasive. It impacts on every dimension of his life. He depends on every person who comes into his life to do the right thing by him. • speak up for him and advocate on his behalf. The extent and breadth of my son’s multiple disabilities not only makes him incredibly dependent on the good intentions and actions of others, but also incredibly vulnerable if these good intentions and actions are not forthcoming (even in one single person who may be involved in his day-to-day life). How could a person with a singular physical or sensory disability possibly understand what life is like for Richard, and for others like him. How does their lived experience of disability help to inform any advocacy they might undertake for the hundreds of thousands of people like Richard in our society? And yet people with physical and sensory disability with a lived experience of their own particular disability are predominantly those who populate the current, generic disability advisory and advocacy groups. Regrettably, there also appear to be many people with physical and sensory disability amongst this same population who deny the legitimacy of the advocacy contribution of family carers who seek to represent and advocate, not only for the needs of their own family member with severe intellectual disability, but for the needs of others like them, who, like Richard, cannot speak for themselves. 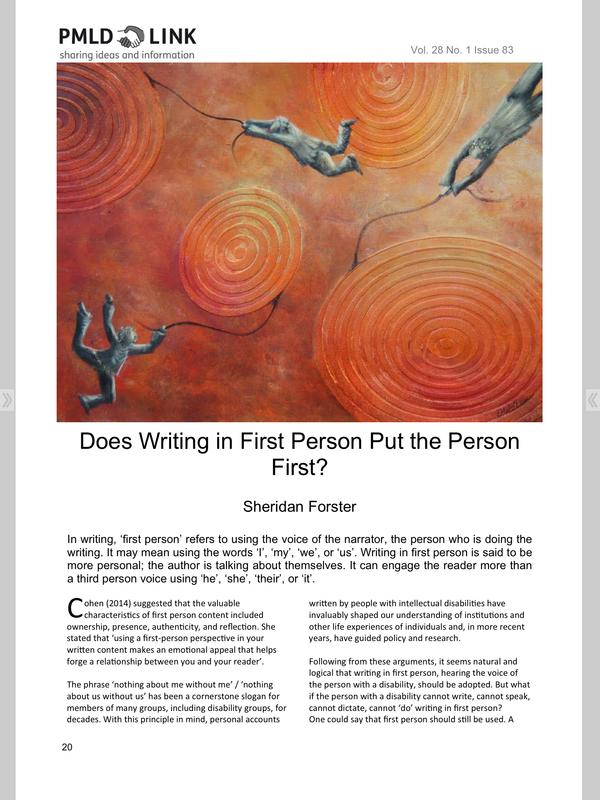 Recently I did a short piece thinking about writing in first person for people with profound intellectual disabilities – that is, writing things about people using the word “I” as if the person wrote it themselves. It’s been great to hear the conversation that this has started. I’ll pop up a pdf link later (but if linked it as an image at the end of this post – Thanks to PMLDlink for allowing me to do this, and Polly Samuels aka Donna Williams for her painting “Illussions of Control”). In one discussion Nell Brown presented two different profiles of her daughter Tess as examples of two different practices. She agreed for me to share them here. What’s your first impressions from the way these are written? Who do you think would be an appropriate “author” for each? What do you think are the pros and cons of each style? What might be the implications for supporting Tess? My name is Tess. I like to be given the opportunity to make choices for myself, but I also like out-of-nowhere experiences, and will become enthusiastic if handled with excitement and humour. I love music and dance (unless I am having problems with voices). People who work with me can offer to put music on, sometimes just having music on can draw me out. If I am in the mood I can dance around the living room for ages. I love praise and respond well to people who make me feel special and take time out to chat to me. I love enthusiasm. I love swimming, drama, friends and family. I love social occasions. I have a lot of hours to fill so this can be flexible f you are studying or working part time elsewhere. Come and meet me and we can see if we suit each other! I am 30, can be very cute and have an intellectual disability and schizophrenia. I am not safe on my own. I tend to internalise and that is not a good thing. I am looking for someone to work with me who loves doing interesting things. I need help with my speech so studying speech therapy, physio therapy OT etc is an advantage. I am looking for someone who can work alongside my speech therapist in order to support me. I would like someone willing to help me with my garden, cook with me and help me develop a range of skills. I love going out for massage but need a support person. Sometimes I am stair phobic depending on my medications working properly. I am on a ‘get fit’ regime, so you must be willing to be physically active – nice long walks (I am not very fast). Working with me on my ipad, taking photos of my day and making storybooks will be fun! I love wacky humour, I love adventure, love musicals and if you like these things, I am looking someone just like you! You need to be strong and resist the urge to buy me sugary or fatty things because I love healthy alternatives too and need your guidance! About Tess…. My daughters name is Tess. She likes to be given the opportunity to make choices for herself, but also likes out-of-nowhere experiences, and will become enthusiastic if handled with excitement and humour. Tess loves music and dance (unless she is having problems with voices). People who work with Tess can offer to put music on, sometimes just having music on can draw her out. If she is in the mood she can dance around the living room for ages. Tess loves praise and responds well to people who make me feel special and take time out to chat to her. Tess loves enthusiasm. Tess loves swimming, drama, friends and family. She loves social occasions. Tess has a lot of hours to fill so this can be flexible if you are studying or working part time elsewhere. Come and meet Tess and her family and we can see if we suit each other! Tess is 30, can be very cute and she has both an intellectual disability and schizophrenia. She is not safe on her own. Tess tends to internalise and that is not a good thing. We are looking for someone to work with Tess who loves doing interesting things. Tess needs help with her speech so studying speech therapy, physio therapy OT etc is an advantage. We are looking for someone who can work alongside Tess’s speech therapist in order to support her. We would like someone willing to help her in her garden, cook with her and help her to develop a range of skills. Tess loves going out for massage but needs a support person. Sometimes Tess can be stair phobic depending on her medications working properly. We have Tess on a ‘get fit’ regime, so you must be willing to be physically active – nice long walks (Tess is not very fast). We are looking for someone willing to work with Tess on her ipad, taking photos of her day and making storybooks. Tess loves wacky humour, loves adventure, loves musicals and if you like these things, we are looking someone just like you! You need to be strong and resist the urge to buy Tess sugary or fatty things because she can be coerced into quality food, as she loves healthy alternatives too but need your guidance as her personal judgement on food is not always in her own best interest.